Whenever I encounter the argument that reviewers ought not to speak negatively of any book they didn’t like, but should instead say simply that the story, while not to their taste, might well be to someone else’s, I experience the overwhelming urge to tear out my hair by the roots. If all reviews were necessarily positive, there’d be little point in reading them: the mere fact of their existence would tell us that the reviewer liked the book, and while there might be some residual interest as to why, after a while, I suspect that the lack of contrast would render the whole endeavour redundant. Individual taste is undeniably a subjective thing, but that doesn’t mean we’re wrong to feel strongly about it, and it certainly doesn’t moot the function of criticism – and subjectivity aside, there’s still such a thing as quality. For instance: if a restaurant served me overcooked steak, flavourless gravy and limp vegetables in a filthy environment, then my best and most useful response is not to swallow my objections on the basis that someone, somewhere might’ve enjoyed the meal, such that warning my friends to eat elsewhere would unfairly endanger the chef’s livelihood. The point being, it’s incredibly disingenuous to pretend that individual taste is only composed of positives, or that what we enjoy matters more than what we don’t. To stick with the food metaphor, if someone wanted to gain a complete understanding of my palette, my strong dislike of bitter flavours, aniseed products and raw vegetables would be equally as important as my love of good cheese, wine and sashimi. It’s contrast that gives the full picture, and when it comes to book reviews – or reviews of any sort, for that matter – it’s the balance between negative and positive opinions that allows the reader to fully compare the critic’s taste with their own. Why do I mention this? Because even though a good story will invariably remind us of our passions, it can also achieve a reverse effect: to highlight, through dint of comparison, what bothers us elsewhere. 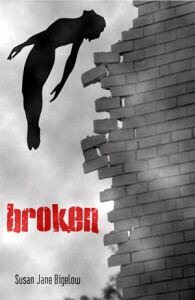 Broken provides one of the most original YA settings I’ve come across for some time. Which brings me to Susan Jane Bigelow’s Broken, volume one in the Extrahumans series, a novel I bought after seeing it positively reviewed by Ana of The Book Smugglers. Set in a future where Earth is just one of many colonised planets, where human-alien trade is commonplace and where superheroes do the dirty work of politicians, Broken provides one of the most original YA settings I’ve come across for some time. Told primarily from the perspective of Michael, a teenage boy who can see the future, and Broken, aka Silverwyng, a former superhero with accelerated healing powers who has lost the ability to fly, the story is an intriguing composite of science fictional, dystopian and comic book elements. Having foreseen the event for years, Michael finds himself the guardian of a baby boy whose actions as an adult will either lead to a golden age or plunge the world into war and totalitarianism. Hunted by the government and with nothing to guide him but disparate glimpses of the ever-changing future, Michael seeks the assistance of the woman he knows only as Silverwyng, without whose help, his visions tell him, the golden age can never come to pass. But Silverwyng has turned into Broken, a homeless drunk destroyed by past betrayals, absent memories and the loss of her power of flight. How can she possibly save Michael when she can’t even save herself? There’s something extremely cinematic about the story, such that it feels like a better candidate for adaptation to the big screen than many stories chosen in its stead. With so many potentially conflicting elements to juggle, Bigelow has done an excellent job of braiding them together into a single, cohesive story. Her writing is smooth and streamlined, moving events along at a pace that’s neither breakneck nor boring. Though the story does slow for two or three chapters near the middle, the change of pace ultimately serves the plot well, providing a solid emotional bedrock with a satisfying relevance to the conclusion. In fact, there’s something extremely cinematic about the story, such that it feels like a better candidate for adaptation to the big screen than many stories chosen in its stead. Both while reading it and subsequently, I’ve found myself comparing its various aspects to films like Looper, Children of Men and the criminally underrated Push: Looper, because of the presence of a child who can either save or damn the future and a protagonist struggling with knowledge of that fact; Children of Men, because of Michael and Silverwyng’s tense pursuit through a bleak landscape to save a baby from the sinister aims of a violent police state; and Push, because of the emphasis on precognition as a guide to action and the presence of teens with superpowers. Broken, with its flawed, prickly characters, original setting, political undertones and organic plot, has quite restored a faith I hadn’t known I’d lost, or was in danger of losing. Ever since the runaway success of Twilight, popular YA novels have been dominated by a particular set of tropes whose ubiquity has more or less become default, at least as far as SFF stories are concerned. Paranormal goings-on at highschool, teenagers with secret abilities, endless love triangles brimming with angst and melodrama, rebels fighting the system while falling in love: I don’t have any inherent objection to these devices, whether used singly or in combination, but reading Broken, which lacks all of them, I realised just how oppressive I’ve come to find their prevalence. It’s reached the point where, with the exception of one or two trusted authors, I’ve almost stopped reading YA – and that’s from someone who writes it. It’s not even a case of other books I’ve encountered being badly written or objectionable; it’s just that, at least as far as the best-seller lists go, there’s enough of a sameness to what’s on offer right now that I’d started to forget that YA can consist of anything else. Whereas Broken, with its flawed, prickly characters, original setting, political undertones and organic plot, has quite restored a faith I hadn’t known I’d lost, or was in danger of losing. It might not be to everyone’s taste, but I certainly found it to mine – and thanks to the contrast of negative and positive, reading it has helped me to better understand not only my own preferences, but the logic which underpins them. Also: superheroes and space travel. What more do you want? I am so pleased to read this review, I find her books to be criminally under-read. Hey, a great review. Honest and thorough: the only way to write. (Also, refreshing to hear about fiction that skips the current cliches and tropes). Can’t read the articles on my HTC. The text is covered by some freaky fuscia color. Somebody tell Aidan, please. Sorry for the unrelated comment. Thanks, Amir. I’m looking into it now. Is it just this post? Definitely an interesting review, and one that makes me want to take a closer look at a book that I admit I previously dismissed out of hand. Thanks! No, Aidan. All posts and the home page as well. No problems at all on my PC, just my mobile phone (HTC Wildfire S, Android 2.3.5), and no problems with other websites. Thanks again, Amir. I’ll continue to troubleshoot this as best I can.